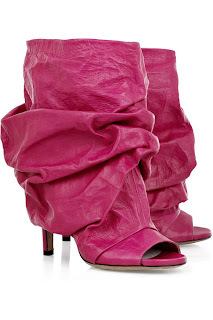 I cannot, and will not, tolerate such abominations to pollute my eyes. What were you thinking? Did you want me to cry? Did you know I wasn't wearing waterproof eye make up and thought it'd be fun for me to end up looking like The Joker? And to charge £625 for them? I really like those heels!! These are truly hideous. I do not understand all of these dumpy looking boots being made. I actually like these a lot. I'm not mad about the color because pink isn't my thing, but I love them!